Vinification & Aging: After the grapes are harvested and destemmed, they go for a soft press for 24 hours. Then, the must is removed into racking in various stainless steel tanks, in order to complete the first alcoholic fermentation that takes place for a period of 10 days. 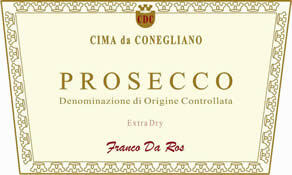 Because of the complicated process of producing Prosecco, once the alcohol reaches 11%, that fermentation is stopped. After that, the yeast is added to the must and macerated for 35-45 days until the bubbles become delicate. Once that maceration is completed, the wine is left in stainless steel tanks at a low temperature of 50 degrees F. Then, the wine is filtered and bottled prior to release. No aging required. Description: Straw color with greenish hues, aromas of green apples and golden delicious, demisec like taste soft and long lasting finish.